This post is Part Three of the Roofing Glossary of Terms series, covering topics I-R.
Two: To add perspective we’ve included a What does this mean for the homeowner? tag for certain terms. That way Dallas and Fort Worth-area homeowners will not only know what flashing is but why it’s important to know. Part One was for terms A-C.
Part Two was for terms D-H.
Ice dam: Condition formed at the lower roof edge by the thawing and refreezing of melted snow on the overhang. What does this mean for the homeowner? Ice dams prevent water from leaving the roof environment. The dams can force water up and under shingles, causing all sorts of problems over time. For the most part, ice dams are not a major concern in North Texas like they are in Minnesota or the Northeast. But, according to some Dallas and Fort Worth roofing companies and contractors, ice dams do form, especially when a part of the roof is shaded and does not receive much sunlight to quickly melt snow and ice. Water lingers and, over time, introduce rot. Interlocking shingles: Individual shingles that mechanically fasten to each other to provide wind resistance. What does this mean for the homeowner? Interlocking shingles may be an option for some homeowners who experience high winds in North Texas, especially during storms in the spring and fall. Laminated shingles: Strip shingles containing more than one layer of tabs to create extra thickness. Also called dimensional or architectural shingles. What does this mean for the homeowner? Laminated shingles are an option for homeowners who want to change their roof’s aesthetics at the time it’s being replaced. 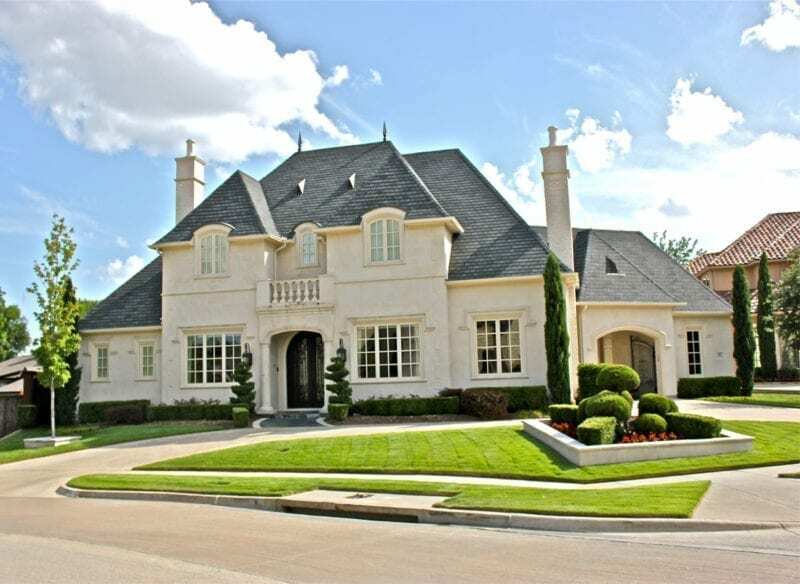 Make sure you use a roofing company or contractor in Dallas and Fort Worth experienced in “design” as much as repair and replacement of roofs. Nesting: A method of re-roofing with new asphalt shingles over old shingles in which the top edge of the new shingle is butted against the bottom edge of the existing shingle tab. What does this mean for the homeowner? Many municipalities have restrictions on the number of times homes can be re-roofed, or installing new shingles over old ones. Work with the roofing company or contractor you choose in Dallas and Fort Worth to determine if your home’s roof can be “nested” or if the roof needs to be completely replaced. Most of the time roofs can be re-roofed just once, which may or may not be a good strategy for the home depending on circumstances. Ply: The number of layers of roofing (one-ply, two-ply). Racking: Roofing application method in which shingle courses are applied vertically up the roof rather than across and up. What does this mean for the homeowner? Not a recommended procedure. Ridge: The uppermost, horizontal external angle formed by the intersection of two sloping roof planes. What does this mean for the homeowner? When damaged roofs need to be replaced, roofers may suggest adding ridge vents if they are not already present. Ridge vents provide uniform cooling along the roof deck, installed from roof end to end with a low profile. Discuss roof vents with the Dallas or Fort Worth roofing company you select to determine if they will work for your home. Ridge shingles: Shingles used to cover the horizontal external angle formed by the intersection of two sloping roof planes. What does this mean for the homeowner? When a roof is being replaced, how the ridge shingles are installed and the materials chosen will impact the aesthetics of the roof and the overall look of the home. Roofers and contractors are increasingly using the replacement opportunity to help people differentiate their homes from their neighbor’s by accenting ridge lines with accentuated shingles and materials. Roofing terms S-Z including soil stacks, telegraphing, and vents.